February 11, 2011 · Filed under "at Fat Toaster Farm..."
Both of our Scottish Highland heifers were bred to CD Poseidon (a white loaner bull) in late winter/early spring of 2010. Nine months later the ladies have given us two lovely calves! Our first calf came from CD Can’t Touch This. 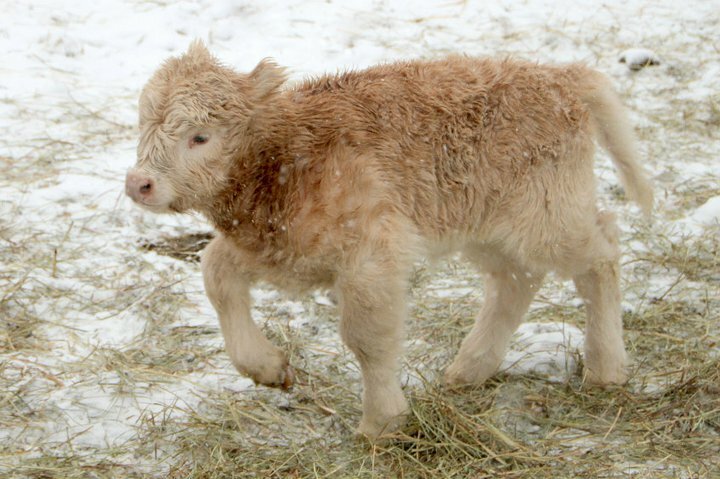 The calf was born on the day of her namesake 12/21/2010… “Winter Solstice” is a white heifer calf born in the snow on one of the coldest days of the year. Later that night we were treated to freezing rain, and (despite our best efforts) “Touch” and “Solsti” spent the night under a tree in our pasture… in the full wind and snow/rain. Considering that this was our first Highland calf, we were worried that the calf would be distressed by the lack of a warm place with a roof. The calf was still wet from the birthing process, but weathered the first night (and many thereafter) with no trouble. Our second calf came about a month later. CD Copper Penny gave birth to “Seamrag Bhàn” (Scots Gaelic), also known as “White Clover”, on 1/30/2011. We came home from church to find “Penny” near the hay feeder building giving birth. The feet were out, and (although unnecessary) I was able to assist to quicken the birthing process. 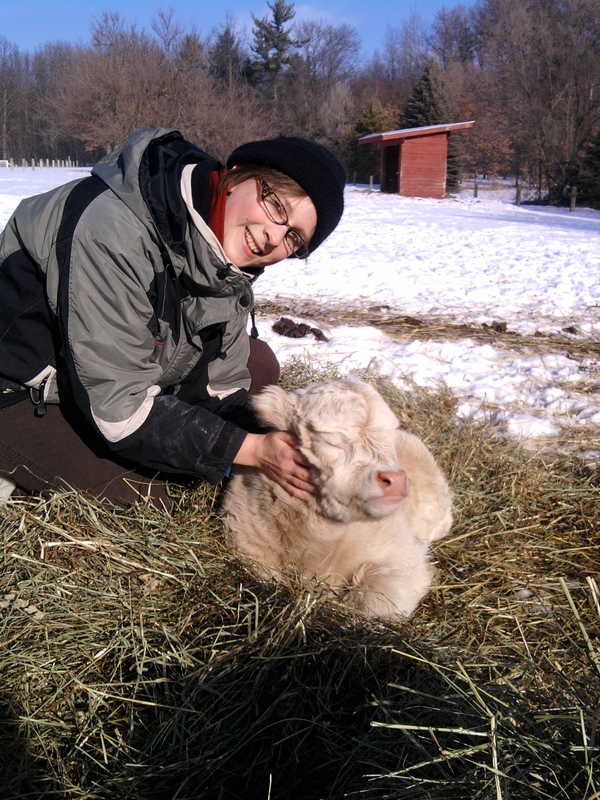 “Clover”, a white heifer, was also born in the snow… around 12 inches of it. The sun was shining, but the cold wind was incredible. 48 hours later we got another 18″ of snow dumped on us, and yet the new calf seemed not to notice. She just played happily… bouncing about… and slept next to mom. 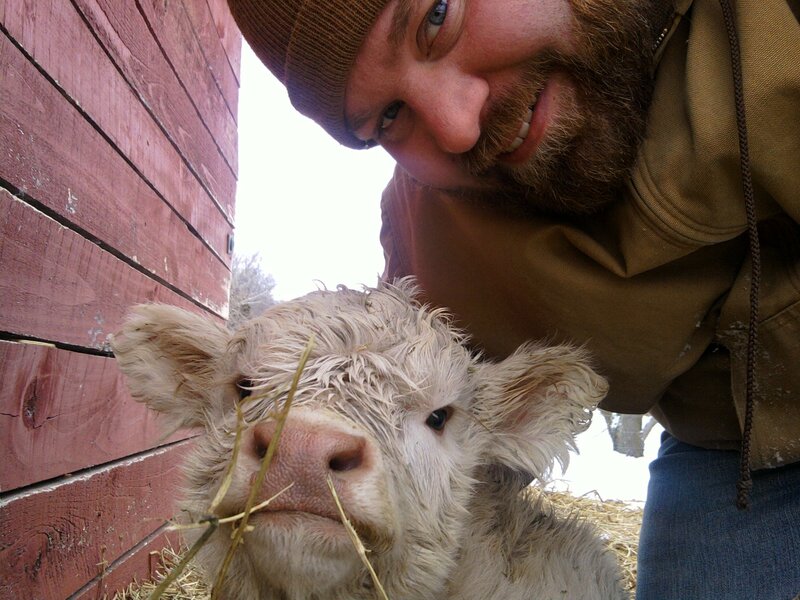 Both calves were named by our facebook friends, and Solsti was born just in time to be featured (along with all the other critters on our farm) in a photo gallery show at Coopersville Farm Museum in Coopersville, MI. by Peg Alofs Becker.